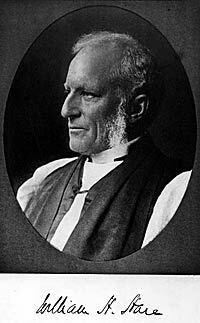 William Hobart Hare was a missionary bishop to the Niobrara Territory and later the ﬁrst bishop of South Dakota. Hare was born in Princeton, New Jersey, in 1838. Although he studied at the University of Pennsylvania, he never received a degree and prepared for ordination without attending seminary. He was ordained to the diaconate in 1859 and to the priesthood in 1862. He served St. Luke’s and St. Paul’s, Chestnut Hill, both in Philadelphia. He moved to Minnesota in 1863 with the hope that a different climate would improve his wife’s failing health. It was there that he ﬁrst came into contact Native Americans, an encounter that would change his life and shape his vocation. Hare returned to Philadelphia in 1867 to become the Rector of the Church of the Ascension, but his personal interest in the church’s ministry among Native Americans never waned. In 1871, the House of Bishops of the Episcopal Church created the Missionary District of Niobrara encompassing much of the Dakotas. A year later, the House of Bishops elected Hare to become the Bishop of Niobrara and he was ordained to the episcopate on January 9, 1873. Bishop Hare, often referred to as “The Apostle to the Sioux,” devoted himself to work among the Native Americans in the vast expanse of the Niobrara Territory. Well ahead of his time in his approach to mission work, Hare believed it was important to honor as much of the tradition and culture of the people as possible. His desire was not to destroy the fabric of Sioux culture, but to bring the gospel into the midst of it so that the people could also come to know Jesus. Instead of suppressing the customs of the people, he saw them as vessels that could communicate God’s grace. In 1883, the House of Bishops divided the Missionary District of Niobrara into the districts of North and South Dakota. Bishop Hare from that point took responsibility for what would become the Diocese of South Dakota. I. Wakantanka, Holy God, who didst call thy servant William Hobart Hare to bear witness to thee throughout the vast reaches of the Niobrara Territory, bearing the means of grace and the hope of glory to the peoples of the Plains: We offer thanks for the devotion of those who received the Good News gladly, and for the faithfulness of the generations who have succeeded them. Strengthen us with thy Holy Spirit that we may walk in their footsteps and lead many to faith in Jesus Christ, in whom the living and the dead are one; and who liveth and reigneth with thee and the Holy Spirit, one God, now and for ever. Amen. II. Wakantanka, Holy God, you called your servant William Hobart Hare to bear witness to you throughout the vast reaches of the Niobrara Territory, bearing the means of grace and the hope of glory to the peoples of the Plains: We give you thanks for the devotion of those who received the Good News gladly, and for the faithfulness of the generations who have succeeded them. Strengthen us with your Holy Spirit that we may walk in their footsteps and lead many to faith in Jesus Christ, in whom the living and the dead are one; and who lives and reigns with you and the Holy Spirit, one God, now and for ever. Amen. Collect. A collect that begins with the word ‘Wakantanka’? I’m sorry, it doesn’t work. The entire collect is so different from other new commemoration’s collects. It has too many phrases, 11 lines and 113 words. Gospel. Does the Samaritan Woman at the well work with Bishop Hare? Why are there two separate commemorations on the same date? Is it because Hare and Marshall share a death date? Even so, does this occur elsehwere in HWHM? is the intent to let local congregations choose whome they will commemorte on this day? Help! Actually May 17 is William Hobart Hare’s birthday in 1838. He died on October 23, 1909. I do not know why the October date is not his feast day. Yes, May 17 is the date of his birth. October 23 is the feast of James of Jerusalem, so the committee opted to use Hare’s birthday as the date of commemoration. After the calendar was compiled, General Convention added the commemoration of Thurgood Marshall on May 17, the date the historic Brown v. Board of Education decision was handed down (Marshall argued the case for the plaintiffs before the Supreme Court). Wakantanka, Holy God, who didst call thy servant William Hobart Hare to bear witness to thee throughout the vast reaches of the Niobrara Territory, bearing the means of grace and the hope of glory to the peoples of the Plains: We offer thanks for the devotion of those who received the Good News gladly, and for the faithfulness of the generations who have succeeded them. Strengthen us with thy Holy Spirit that we may walk in their footsteps and lead many to faith in Jesus Christ, in whom the living and the dead are one; and who liveth and reigneth with thee and the Holy Spirit, one God, now and for ever. Amen. “Wakanataka” — really? This strikes me as committee-driven faux-multiculturalism at best and tokenism at worst. Wasn’t one of the requirements of HWHM that it be in a style commensurate with the ’79 BCP (or am I quoting from the SS projects)? Following a bio that goes on about how Bp. Hare didn’t impose the culture of others on the Sioux, this seems ironic…. “Strengthen us with thy Holy Spirit that we may walk in their footsteps and lead many to faith in Jesus Christ, ” — same as above; what happened to Hare? ” and who liveth and reigneth with thee and the Holy Spirit, one God, now and for ever. Amen.” — Quality! Once again, a commemoration of an odd couple, united only by date. Give Marshall the date (for Brown) and bump Hare to the next available or a traditional alternate (like the date of his episcopal consecration). We celebrated this feast at our Eucharist this morning. As I had read Michael Hartley’s comment on the Gospel reading, I brought it up during the homily (we’re inter-active on Tuesday mornings). The consensus opinion was that, just as both Jesus and the Samaritan woman had to deviate from their culturally accepted norms to meet as equals, so did Hare and Sioux. Besides, it’s a great reading in and of itself, and there’s only so many times you can use the more obvious “apostolic” Gospels before they lose their impact. It’s also a convincing – albeit circumstantial – proof that Jesus was not married to Mary Magdalene or anybody else. The collect is another matter. Neither of our priests were willing to read the word “Wakantanka” (I suspect one might have tried if a pronunciation guide had been provided). While Wikipedia might lead one to think that Wakantanka is simply the Sioux equivalent of our “god,” a generic term for divine beings, The Encylopaedia Britannica says it’s the name of their supreme god: “An interesting pluriform system is that of the Oglala Sioux of the United States, who venerate 16 gods divided into four groups of four. Each group of four forms one god. Thus there are four gods, but these four gods again are one god, Wakan Tanka—the Great Spirit or the Great Mystery.” (And you thought the Trinity was a difficult concept!). Iupiter Optimus Maximus, Father of all things, Ave! We hail you by your name or by whatever other title you wish to be called. By your Spirit you called Cornelius the Centurion to be the first Christian among the Gentiles . . .
O Zeus, Father of gods and humans, in whom we live and move and have our being, you found your martyr Justin wandering from teacher to teacher, seeking the true God, and revealed to him the sublime wisdom of your eternal Word . . .
HaShem the Merciful, Master of the universe, whose servant Joseph of Arimathaea with reverence and godly fear prepared the body of our Lord and Savior for burial, and laid it in his own tomb . . .
Vishnu, All-Pervading Essence and Governor of all things, Preserver of the Universe, we thank you for the courageous and independent spirit of your servant Pandita Ramabai, the mother of modern India . . .
1. I’m all in favor of commemorating Bishop Hare. 2. Yes, that Collect is pretty awful. “Wakantanka” — I understand the point, but I have to agree with MIchael Weylandt — “committee-driven faux-multiculturalism at best and tokenism at worst.” “Niobrara” is still a known term, at least in Province VI, and survives in the Niobrara Convocation. And although Bishop Hare may have once been referred to as “The Apostle to the Sioux,” it is my understanding that “Sioux” is not how the Lakota and related tribal communities refer to themselves today. Have this bio and collect been run by any of the descendants of the peoples with whom Bishop Hare ministered? This Collect is an extreme example of something we tend to do too much of in our “lesser feasts” — explaining to God who we are commemorating and why, in case God has forgotten. Well, yes, we need to explain these commemorations to our congregations, but (1) right at the beginning of the service we can say (and I often do): “Today we commemorate So-and-so, who did such-and-such in the umpteenth century in such-a-part-of-the-world. And then (2) at the homily a bit more bio information, perhaps noting why this person is an important example for us today. Insightful point about collect structure in general and the trend of making everything a mini-lesson. I think Mr. (Fr.?) Moorhead is right: “a time to every purpose under the heaven:” time for introductions and time for prayers. The pre-service bio-reading has become a staple of the weekday Eucharists at our place that people have taken to arriving a few minutes early so they catch it. (Material repeated before the sermon if any arrive late and miss the bio) I think it helps set the tone better than putting the bio at the sermon-slot and making people retroactively forge the connections. On a personal note, having grown up in a rite I / 1928 world, the use of the second person clauses in collects strikes me as the root of all this explaining to God business, but I understand it’s necessary with the decline of the vocative-relative clause structure in everyday English. A better subtitle would be: “Missionary to Native Americans”. He is not listed here because he was a bishop, but because of his pioneering work as a missionary..
Delete the redundant first paragraph: the “headline writer” is at work again here. Hare died on October 23. Is there an understanding that “pairing” should not include the day appointed for an early Church Father? If so, I would suggest transferring this commemoration to October 24. Line 1, second paragraph: substitute “on May 16, ” for “in”. Line 3, third paragraph: add “with” after “contact”. Line 1, fourth paragraph: was this an action that could be brought about by the House of Bishops alone? Wasn’t this an action of General Convention? Line 2, sixth paragraph: capitalize “Districts”. Line 2, sixth paragraph: add “Dakota” after “North”. Line 4, sixth paragraph: add a final sentence: “He died on October 23, 1909”. He may well have died in Sioux Falls, but I have found no evidence of the place of his death. It should be added here. I finally found where he died: in Atlantic City, New Jersey. And what about his wife? Died, divorced, abandoned, raptured? I agree with everybody else about the collect, and also wonder why he couldn’t be bumped either to May 18 or October 24. Grace, you obviously have never been to the Badlands. Agree that Wakantanka ought not be included. Wonder about only half the story of the Samaritan woman.